Giggles Embroidered Bib | Cream | Protect baby clothes from getting stains. 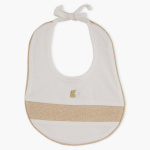 Pick this stylish bib and tie it around your baby's neck during the time of feeding, to ensure that your baby's clothes do not get stained. The unique-looking bib comes with a lovable embroidery and a patchwork on the front. Feature 2 : Tie up for ensuring comfort fit.